Last week, I presented you my experimentation's project about cryptocurrencies with some basic definitions. Being a rookie myself, I then had to face the first questions that any investor has to ask himself, namely: which portfolio to choose, which online brokerage platform to select, and how to buy/store concretely my first bitcoins and other cryptocurrencies? Before I go any further, I would like to point out something: cryptocurrencies are an instrument that is always very volatile, and I don't recommend anyone to put their hard-earned money into this vehicle. I see this experiment rather like going to the casino, at the risk of losing everything when the bitcoin bubble burst. After various readings on the web and several exchanges on the dedicated thread of the MP forum, I came out with three cryptocurrency names: BTC for Bitcoin, ETH for Ether, and LTC for Litecoin. They correspond to the gold standard in the world of virtual currencies. Knowing that I only want to invest 1'000 euros in this game, I didn't want to waste too much time gambling on the best distribution, so I went with 1/3 for each currency. My investment strategy remains the same as for equities: buy and hold them for a long period of time. Which online broker to buy cryptocurrencies from Switzerland? There exist a plethora of options when you begin to delve into the vast subject of cryptocurrency brokerage platforms. And that's without taking into account the storage solutions of your virtual money that can be decoupled from your purchase platform in order to increase the security of your money. Coinbase: a brokerage online solution amongst the most famous and renowned, which allows you to buy your cryptocurrencies and store them in a virtual wallet on the same platform. Its ease of use has a fairly high cost with fees for Europe of 1.49% per transaction. 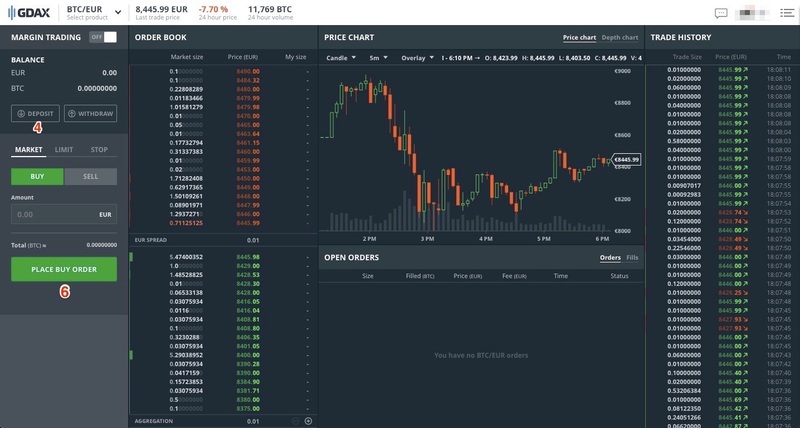 GDAX: the trading platform on which Coinbase is based (both created by the same Californian company Coinbase Inc.) A little more cryptic but with only 0.25% of fees for BTC and 0.30% for ETH and LTC. One of the advantages is that you can create your free Coinbase account to store your EUR and cryptocurrencies, then trade on the GDAX to benefit from its low costs. Indeed, transfers between Coinbase and GDAX are instant and free. Thank you @Mobius for having indicated this solution to me. Bitstamp: Another brokerage platform, recommended by Alex. Their fees are of 0.25% if you buy up to 20,000 USD of cryptocurrencies. Their site and app are a bit more complex than Coinbase, but it's still pretty simple. Compared to my choice of brokerage platform for my stock trading, I allowed myself to go for the simplicity for this cryptocurrency experiment: I opened my account at Coinbase. 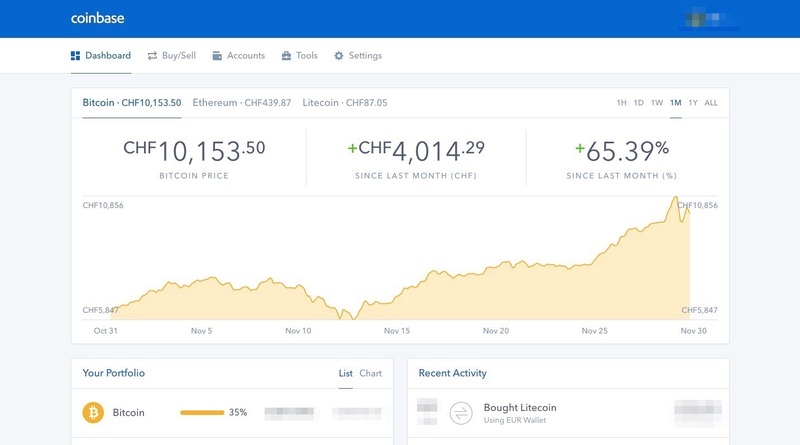 How to buy cryptocurrencies on Coinbase? Once your account is opened, you must make a first money transfer that is free if done via SEPA wire transfer - or paid if via credit card (3.99% fee). An interesting feedback to share: Coinbase refused my first transfer of 1'000 euros indicating that to validate my bank account I had to send a small amount in the first place. As a result, they returned my payment and I lost money because of the EUR-CHF exchange rate... I did a second transaction of 1 euro which passed, and then I was able to send my 1'000 euros without any issue. I strongly advise you to make this initial transfer of 1 euro, so you avoid a loss of money for nothing. Once the euros are on your Coinbase account, everything is very simple. Whether via the Coinbase web platform, or via their iOS or Android apps, I don't present you screenshots because everything is so intuitive. Once logged in, click on "Buy", choose the cryptocurrency you wanna acquire, select your virtual currency wallet in euros, and validate the transaction. That's all! As planned, I'm ending with fifteen euros of fees (i.e. the 1.49% mentioned above). It's outrageous, and it's only because it's for a little experimentation on the blog that I accept it. What I recommend, however, is to go through GDAX to pay only 0.25-0.30% of fees. After checking the platform in more detail (a little too late), I realized that except a few more clicks, it's not that complicated. The steps: 1/ Create your Coinbase account, 2/ Transfer euros to it, 3/ Go to GDAX, 4/ Click on "Deposit" at the top left, 5/ Choose "Coinbase account" then proceed with the funds transfer, and finally 6/ Click on "Place buy order" to acquire the cryptocurrency of your choice. When do you advise me to buy, MP? Now. Don't wait for Bitcoin or Ether or Litecoin to come down again. Or that they go below a certain threshold. Tomorrow the bitcoin may be at CHF 1'000, or at CHF 35'000. Nobody has any clue. Buy now. In summary, if you are like the majority of my readers, i.e. you aim to test cryptocurrencies for the long term, then buy it now, remove the Coinbase app from your phone, and forget about all this frenzy that only makes you waste time and money. We all had our dose of fun and gambling, as if we had spent an evening in Las Vegas. Now, I propose to return to our respective activities which are much more interesting and less volatile than these crypto-currencies. For my part, I'll give you an update about my portfolio in a few months, once there has been some news, like a big crisis, or a price boom. In parallel, I'll keep an eye on the forum cryptocurrencies' thread. And you, what is your strategy with cryptocurrencies? You ignore them completely? Do you base 100% of your financial independence strategy on it? ← 10 gift ideas for kids — other than toys!